A challenge in daily practice in medicine is making sure when reporting back to the referring physician, that you are answering the question that led to the referral. A key part is to not just respond with an assessment and plan along with highlights of the examination, but also the rationale behind your thought processes. It would be the equivalent of showing your work when you used to have math homework and you needed to show the teacher how you came up with the answer. The more sub-specialized we are in medicine, the more our diagnosis is based on pattern recognition as opposed to generating an exhaustive differential diagnosis and ordering a bunch of tests. As a glaucoma specialist, I have to recognize a pattern and act on it. Whether this is ruling out glaucoma, confirming progressive damage needing a certain type of surgery, or why surgery should not be done despite progressive damage - this needs to be conveyed in the consult report. 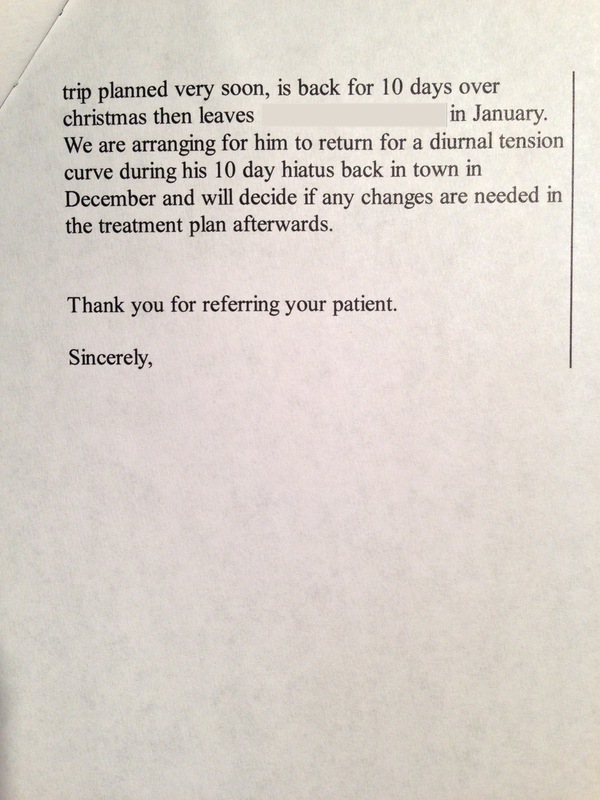 A canned auto-generated letter from an EMR needs to have room to show your work. NTG patient to return for DTC but why? This patient was seen for Normal Tension Glaucoma (NTG) with the referring doctor wondering if they need surgery, and it was decided that this is one of the rare times I would have them return for a diurnal tension curve to see how her pressure ranges throughout the day. This consult report, as originally written and sent, just states that the treatment plan is to have them return for the DTC. The patient was referred for possible glaucoma surgery and the response is that their treatment will consist of measuring their eye pressure at multiple times in a day? Why? By appending the report with a rationale that explains what would be gained by this DTC, it completely changes the letter from one that is practically useless and does not address the concerns of the referring doctor who is expecting surgery yes or no. With an explanation that the DTC will help decide whether this patient really is at risk of progressive glaucoma damage requiring surgery versus being fine under observation for now is a huge improvement and shows that you actually saw the patient and are addressing the concerns of the referring doctor. 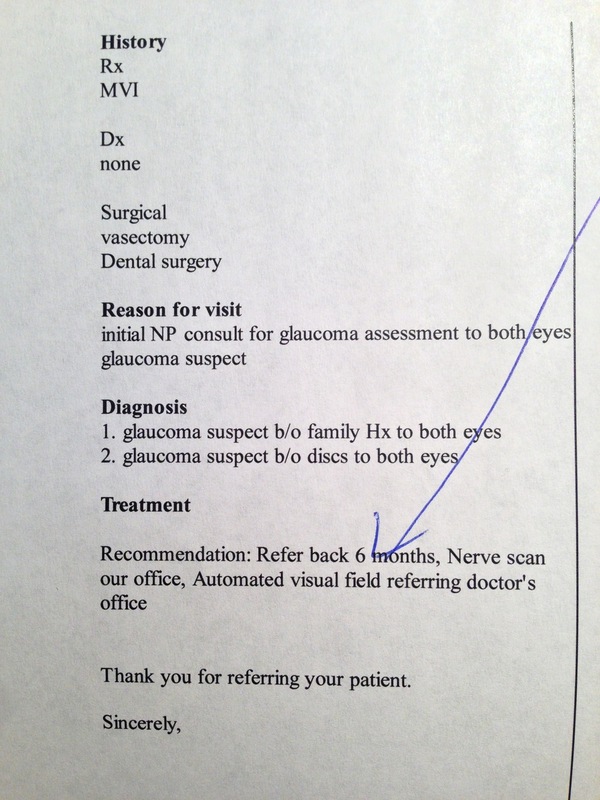 Glaucoma suspect - see you next time? Another patient, this time a fairly routine referral asking whether this patient might have glaucoma? The first draft of the generated consult report asks that the patient be referred back in 6 months for repeat assessment. Does this adequately address the referring doctor and the patient's concerns? The referring doctor thought this patient might have glaucoma; how is see you in 6 months the correct answer? Again, before and after revising the generated consult report in order to show that you did weigh the risk factors and agree they are significant but do not believe this patient has glaucoma at this time. 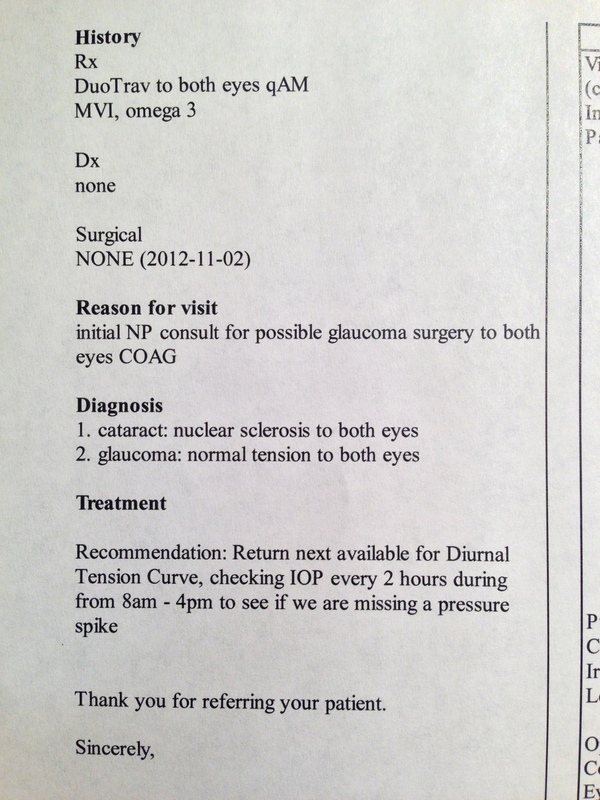 Glaucoma progressing on multiple meds - needs surgery? Another patient presenting on the same new patient consult day, again where the plan is to perform a diurnal tension curve in response to whether this patient needs surgery. Once again, the explanation of the rationale for this approach makes the difference between the referring doctor wondering why I am not rushing to operate on the patient that might make them wonder if I even saw the patient or read the referral note. Are you always making sure you are answering the question being asked of you when you see a patient? Does your EMR allow you to include a treatment rationale? Can anyone looking at your chart or consult report follow your line of reasoning clearly?